What place in the world has the farthest time zone? I heard it was Kiribati but then I found that Apia (Samoa) is further. So, is there anyplace that is the farthest in time than these two? What about Solomon Islands? The original wording of your question revealed that you are missing something about what time zones are, and how they are defined. So let me start from the begin. If you are impatient, you can jump forward for the answer in bold font after the figure, and come back here for the explanation. Time zones are defined by by man just to facilitate time keeping. In principle the idea is that time anywhere should be such that noon happens when the Sun reaches its maximum elevation over the horizon. Time keeping wasn't easy in the past. Therefore, time was kept by astronomical observatories. And due to the extent of the British Empire, in history was the observatory at Greenwich the one that stayed as the global reference point for time and longitude (because at first the main utility of precise time was to compute precise longitudes). As Earth's rotates 360° in 24 hours, that's 15° per hours. So if you know the longitude of a place, you just divide that longitude by 15 and you know how many hours you have to add/subtract from Greenwich reference time to get your local time. For example: If you are in Eastern Island at longitude 109°W, it means your local time will be the time at Greenwich (know as Universal Time or UT) minus 7 hours 16 minutes ($109/15=7.26\, h = 7h\, 16m$), if you use that time, the Sun will effectively be at its highest point at 12:00 h.
But as you can see, if you move in the east-west direction, every point would have a different time if we just use the above rule, which is very inconvenient, as the time in the east side of a city would be different than the time on the west side. For this reason they invented Time Zones: to keep the same time within reasonable large areas. In principle they created time zones every 15°, so that no point would be more than 30 minutes off their solar time. In other words, the moment the Sun reaches its maximum elevation in the sky won't be more than 30 minutes off from clock's noon. However, this time zone lines crossed political borders, so they were adapted and bent so that whole countries or at lest states remained within a single time zone. That way the current designation of time zones was established and is neatly summarized in this figure from Wikipedia commons. You can see that the most extreme time zones are +14 hours at Line Islands (Kiribati), and -12 hours in and around Baker Islands (US). Therefore, the maximum possible difference between times on Earth is 26 hours. That means that at 11:00 PM of a Monday in Baker Island, it is 1:00 AM of a Wednesday in Line Islands. As both places are fairly close to the equator, I doubt they use daylight saving. Therefore, that would be the maximum. In the case of Apia in Samoa, it also uses +14 hours but only in summer. If you are mostly concern to the time difference with the UK, the largest would be +14 hours to Line Islands. Finally, take into account that time zones are politically defined, so at any time a political decisión can change the actual answer to this question. Given you are in the UK, ignoring daylight savings, Tonga and Tokelau are in time zones that are 13 hours ahead of the UK (i.e. to the east). 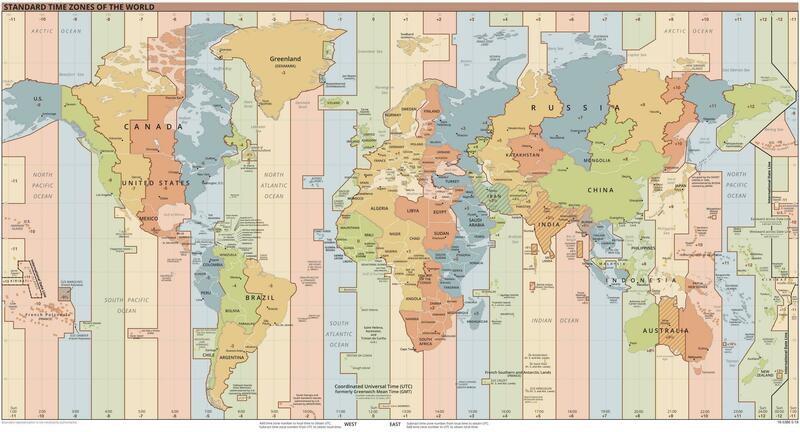 To the west, the largest difference in time is 10 hours behind the UK, for Hawaii, Cook Islands & the Aleutian Islands. Not the answer you're looking for? Browse other questions tagged meteorology geology climate-change geography time or ask your own question. Is there a defined reference period for the COP21 agreement? What is the age of the earth's oil? Is there any case that changed from earthquake safe zone to danger zone? Why isn't the sun due south at noon? “Five of the Solomon Islands disappeared” due to sea level rise, how is this possible so quickly?